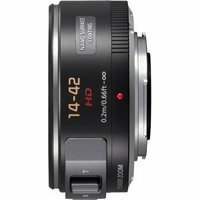 The Panasonic 14-42mm f3.5-5.6 ASPH O.I.S lens is a wide-angle to standard zoom designed specifically for the Micro Four Thirds format. It's ultra-compact and extreme lightweight design offers a versatile zoom range of 14-42mm (28-84mm on 35mm format) suitable for all areas of photography. The lens features superb image rendering for lifelike textures, crisp edge-to-edge contrast, a unique Nano Surface Coating for minimal ghosts and flaring and natural atmospheres with remarkable transparency. Incorporated in the lens is Panasonic's Mega O.I.S. (optical image stabiliser), which makes it easy to shoot super sharp shots even in low-lit conditions by suppressing blur caused by hand shake.